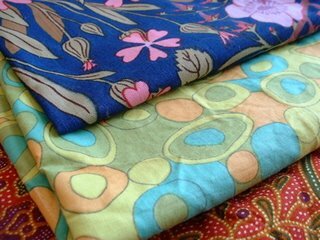 I finally photographed the first lot of fabrics and things I have recently acquired. The top one I have already forgotten where that came from, it’s been knocking around for ages waiting for a photo. The green one was part of a huge stack given to me by Gillian, which also contained lots of other lovely stuff, which is all being processed (washed, ironed, stacked, hoarded, gloated over, stroked etc). Clearly this one hasn’t been ironed yet, in my eagerness to have something to show / say on the blog this weekend (missed, it’s monday now). I also wanted to show off this wonderful pincushion I bought at a car boot weeks ago. Well in fact my friend Rachel bought it for me, because I had run out of money entirely by then. It was a fabulous 20p! Thanks Rach. It was very dusty but has scrubbed up pretty well.I left the original pins and needles in it, as they are quite fun. But as soon as my sewing table is tidier, this will take pride of place, along with one I made myself with turnip fabric a while ago. 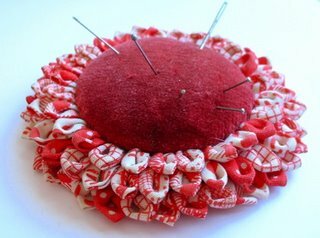 This pin cushion is great! 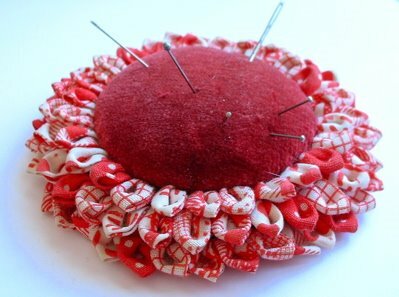 If you haven’t already, then you should join the pin cushion group on Flickr! Wow, what a lovely find. very similar to some Japanese flower corsages I have been looking at.I think its called kanzashi? Anyway very pretty and handy!